This is cool! Can I get a copy of your code? I’m interested to see how you talk to the Wii controller and the LCD. I’d also like to try out the code. I have a PicoLCD 4×20 sideshow on order; it seems that could handle all the IO, with the sensor handled separately. I was also thinking it would be cool to do a rally computer with Arduino… I’m going to see if I have any LCDs I can hook up and may try snagging your code, see if I can get it to work. I would like to try the code out. Hi Paul, almost certainly this is possible. 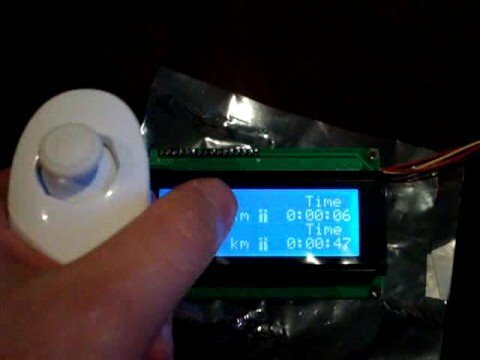 I had someone contact me a little while ago saying that they had done just this with the rallyduino code. That said, it likely varies depending on the type of sensor. Really, all the system needs is a 5v square wave that represents a certain amount of distance. Eg: On a car with 4 wheel studs, each pulse represents 1/4 of the tire circumference in distance. If you can scope what the ABS sensor is outputting, send me an email and i’ll see if I can help in getting it working.